We often talk about various short stories which are often found as Ebook (or other). The idea behind it is, it gives us a chance to read something on the go. Be it a situation where you are travelling or stuck in a traffic jam or waiting for someone at a coffee shop, or even if you have some spare time to use. Here are some of the other short stories and short story collections we’ve explored so far. 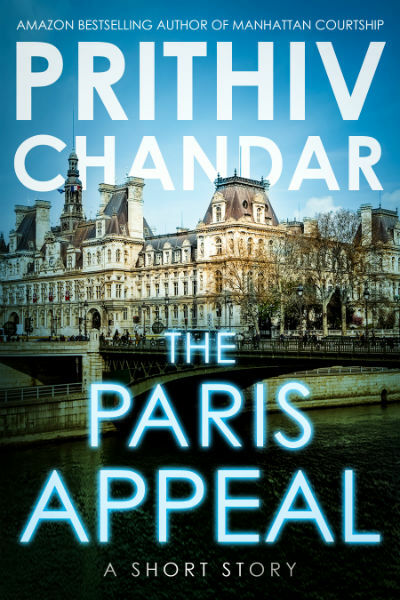 Recently we got a chance to read a short story named The Paris Appeal by author Prithiv Chandar. Let us start with the cover page of this EBook. It is a well designed cover page, which reminded me that of “Derrick Storm Shorts”. If you judge a book from the cover that you will definitely fall in for this book. For the cover design we should give the author full marks :). Now let us take a bird’s eye view to the plot of the book. Roxane is a strong and hardworking self dependent young lady. She lives in the poor condition and she doesn’t leave any stone unturned (in terms of her own power) to get a better and comfortable life. Fighting against odd circumstances is her daily routine. In order to survive, she even had to eat what is not of good quality. And she is not alone, she is living and working with a group of people who almost all fall in very similar category. The tough situations of life are not able to take generosity away from her! Despite living in hard times, she does some social work also. Her aim is to return the maximum to the society. She was associated with an orphanage and gave her services (and even money) to that from whatever she earn. There comes a situation when they need a large amount of money to save the orphanage. Coincidentally, a wealthy businessman staying at the hotel where she is working. She sees a ray of hope in him. What will she do to save the social cause she is working for? Will she put her steps on the path of crime? Will she chose the path of adultery? Will she even be able to survive? Well, you can read the short story to know. It is indeed a very small read and will hardly take half an hour to complete it. Also, this is not a very thrilling or light read. While, we all are aware with the beauty of Paris and remember it for the praise for beauty and arts the visitors have showered on it. It is indeed a good city as per the reviews. But, every coin has two sides. Everyone living in Paris is not an artist. Everyone living in this splendid city doesn’t live the life of luxury. However, the real struggle the common people face through each day, is found less explored. The author should be appreciated for doing the same. And, please remember, he didn’t represent the city in any wrong or ill manner. Her colleagues had mentioned that at least she doesn’t have to walk in the snow, but she knew the rain was worse. She knew it seeped into your bones worse than just the cold, and you couldn’t escape the heavy, sick feeling you would get after being drenched. And here is a perfect combination of harsh reality, splendid surrounding and emotional quotient. Moonlight filtered in through the wires that were spread between buildings, and the tiny teardrops that fell from the heavens turned to silver as if the angels were weeping. But they knew if they didn’t get the rejected food, they wouldn’t have the energy for their shift. She considered her existence pitiful, and yet she couldn’t change it. Between her job at the hotel and her time with the NGO, she is always exhausted and yet fulfilled. Other two major characters in this story are Ruby and Frank Moyer which are explored nicely. The book starts with harsh realities and may not be found interesting by many readers for not being a light read. It still has the emotional quotient and good literary qualities. It is all about how good you can be and how positive things can happen. Actually, telling more about it will contain spoilers, which I am trying to avoid. If you love meaningful reading, you can surely go for this EBook. Around 6.5 to 7 stars out of 10. 1. Subtle and fewer conversations, with more of story to read. These points made me love reading this short n sweet packet of romance!!! !